This Bat ring has been one of my favorites for many years. Light, simple and elegant, the thin shank is formed into the classic shape of a bat. Originally created to accompany the the Bat Amulet, this rendering of the Bat is different: instead folded up tight and sleeping on a chain around your neck the wings are stretched out to full length: from tip to tip wraps across the finger. The over all shape of the ring is sleek, the widest point is only 7 mm tall allowing other rings to adorn your finger, or shine “solo” on your hand. 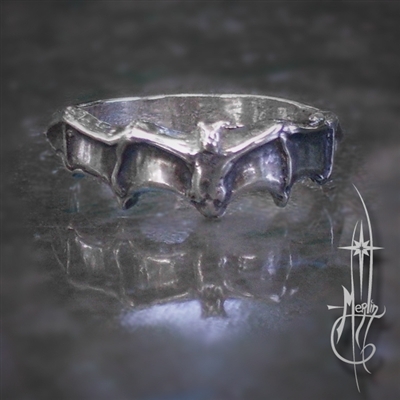 If you are a big fan of Batman, a lover of Vampire tales like Dracula, Anne Rices’ stories like Queen of the Damned or Trueblood’s ongoing television (or book) series, this ring embraces them all. To see and order your Bat Ring, please visit my Bat Ring Page.